Im a rootin', tootin', pistol shootin' boot scootin' high falootin', howlin' hootin', bank lootin', cowpoke! I bet that John Wayne couldn't do an elaborate soft-shoe routine, while rescuing the townspeople from crooked ranchers. - r.p. 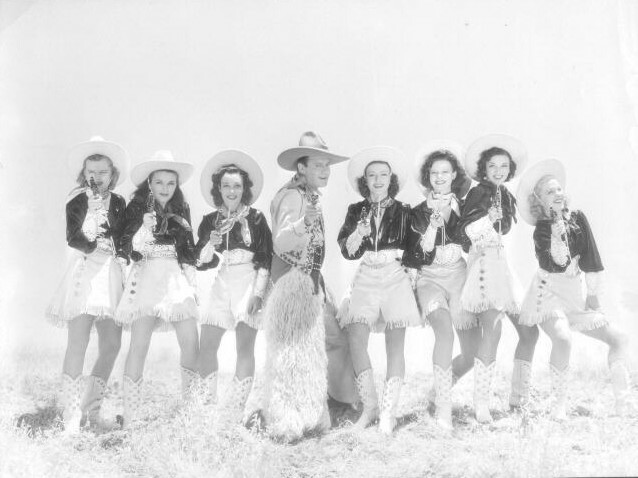 Sheriff Buck Benny with his chorus line of dep-beauties - Sarah K.
And I'll take my stand Against any man. Cuz my gals cannot endure such stuff. Yippee-io-ki-ay! Yippee-io-ki-ay! - Sarah K.